Our music department is a lively, busy, happy and fun-filled part of the Kirstenhof Primary community. We have a number of music teachers, both full-time and part-time, who teach a variety of different instruments. They are also responsible for teaching music to every class in the school from Grade R to Grade 7. In class-music, children sing songs, learn about musical instruments, the elements of music, different styles and eras of music, how to read and play music, and they have fun working in pairs or groups on composing djembe drumming pieces, melodies, graphic scores and putting music and sound effects to poems and stories. We are very much a “singing” school in that there are two group singing practices and two assemblies which take place each week. These are important “musical times”, where the Kirstenhof children not only get to sing songs altogether as a school, but also learn important values and morals through the songs that they sing. Our Kirstenhof children LOVE to sing and it is really heart-warming to hear over 900 children singing their hearts out together. Learners at KPS can also choose to learn a musical instrument at school in addition to attending weekly class music lessons. Instruments on offer at the moment include piano, clarinet, flute, saxophone, recorder, guitar, drums and violin, with piano and guitar proving to be the most popular. Not only do children learn to read and play music on their instrument, they also learn important skills and values such as perseverance, diligence, confidence, self-discipline, team-work, commitment and responsibility. 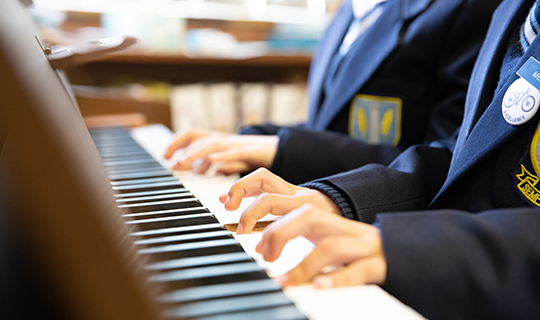 Many of our music pupils enter the Trinity College London and ABRSM exams and are also given the opportunity to perform at our many concerts and assemblies throughout the year. Children are also welcome to join one of two choirs or the Orff percussion ensemble which often expands into a small orchestra. We regularly put together other smaller ensemble groups (strings, recorders, woodwind etc) for various concerts and performances. Our choirs are especially popular. Our music department recognises the importance and impact that learning a musical instrument has on a child’s physical, social and emotional development and is committed to bringing the joy of music into children’s lives.